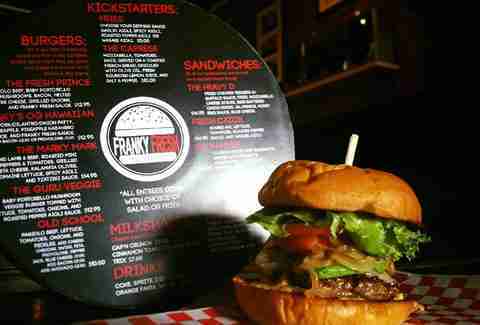 Franky Fresh (address and info) Manoa If scarfing down juicy burgers while watching classic hip-hop music videos sounds like your idea of a good time, you’re not alone. Parking at the small lot at this '80s-inspired burger joint fills fast, but pay-to-park stalls are available across the street. Try the Fresh Prince: Big Island beef, baby Portobello mushrooms, melted Swiss cheese, grilled onions, and special sauce on a toasted challah bun. Burgers are served with a bucket of crispy fries; choose your dipping sauces, from roasted red pepper, garlic aioli, wasabi, and spicy mayo. After you've wiped the grease off your hands, exercise your opposable thumbs with a game or two of Mario Kart or Street Fighter II on the Super Nintendo. Menya Musashi (address and info) Ala Moana Named for the 17th century samurai Miyamoto Musashi, this Japanese noodle shop chain is adorned with artwork honoring the legendary swordsman. 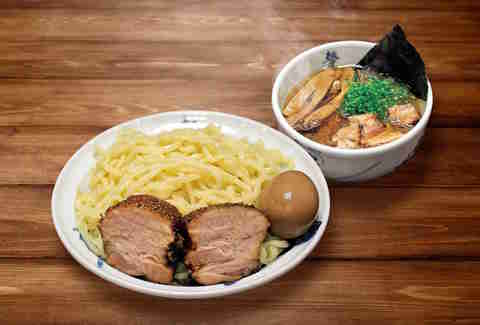 While admiring the walls, slurp up warm bowls of ramen or tsukemen from four broth bases: tonkotsu, spicy, goma, or shoyu. Each bowl is garnished with thick slices of braised pork, bamboo shoots, green onions, and nori. Utilize the table's condiment jars -- the spicy tempura flakes pack an impressive punch of texture and spice. Aloha Terrace (address and info) Waikiki A restaurant specializing in loco moco, one of the island’s best-known comfort foods, almost needs no explanation for making this list, but here it is. Including the traditional hamburger patty, fried egg, and gravy over white rice, there are at least six daily loco mocos. Find iterations like kimchee, curry, or braised short rib moco, and that's only naming a few. If you’re not in the mood for a specialty loco moco (does that state of mind exist? ), there are gravy- and egg-less plate lunch options on the menu, too. Countryside Café (address and info) Waianae Like mom’s home cooking, only you don’t have to do the dishes after you’re done eating. Tucked on the island’s west side, this all-day breakfast joint is the perfect stop for refueling after scaling the Waianae Range. If inhaling giant portions of corned beef hash or Kalua pig Benedict isn't your thing, there’s always red velvet and buttermilk pancakes. And bananas Foster French toast. And Teri chicken kimchee fried rice. Just come hungry, OK? Da Hawaiian Poke Company (address and info) Kapahulu Fresh is the word of the day, everyday at this new Kapahulu poke joint, and you can taste the difference. Choose your seafood and tofu options from the poke bar, and add your own toppings, like ikura, crispy garlic, wasabi aioli, and even natto. 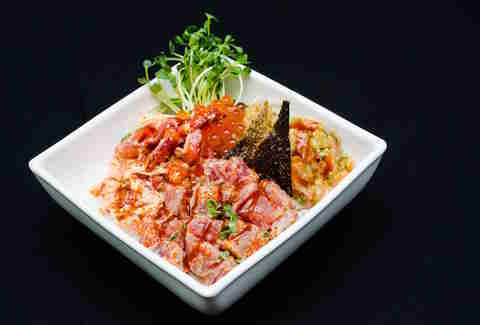 For a seafood extravaganza, go for the HPC Shaka Bowl, jam-packed with spicy ahi poke, Maine lobster, wasabi foam, yuzu tobiko, furikake wasabi salmon poke, ikura, uni, daikon sprouts, and crispy salmon skin (phew), all drizzled with kabayaki sauce, and call it a (good) day. 'Ai Love Nalo (address and info) Waimanalo Ever tried vegan laulau? You have two meat-free options at 'Ai Love Nalo: slow-cooked veggie Oh Wow Laulau and coconut-soaked Okinawan sweet potato, tofu, and veggie Kaukau Laulau. While you may not convert to veganism after eating at this Windward-side eatery, your stomach definitely won’t miss the meat. The Local Hawaii (address and info) Kailua Forgo the president’s favorite Kailua spot for a day, and try the natural, locally sourced fruit syrups at this new shave ice shop tucked inside a clothing boutique. With original concoctions like Crack Seed Lemon Peel and Guava Hawaiian Chili Peppa, you won’t find flavors like this anywhere else. Arch Café Honolulu (address and info) Makiki Who would’ve thought you'd find the best acai bowl tucked between the free weights and rock-climbing wall at Volcanic Climbing & Fitness? Nevertheless, this new joint offers a refreshing post-workout or post-anything treat, with their giant made-to-order bowls filled with fresh fruit and granola. 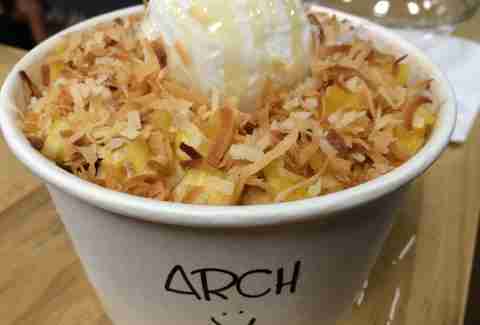 The Arch bowl comes with a scoop of haupia sorbet, but the creamy, coconut-flavored treat can be added to any bowl for an additional $2. Infinitea (address and info) Ala Moana Located in the new 808 Center, this tea and smoothie shop has more than 80 drink options. Choose your sweetness level, amount of ice, and size, ranging from regular to monster for the super thirsty. Topping choices include tapioca balls, chia seeds, flavored pop rock boba, ice cream, jellies, and eye-pleasing tea extras like heart, star, bear, and, dolphin-shaped jellies. The Dumb Coq (address and info) Downtown This new King Street restaurant initially garnered attention because people were, well, intrigued to discover just what kind of food goes with such a suggestive name. The answer so far: starters, soups, salads, sandwiches, a burger, and steak. An early favorite is their made-to-order Coq Monsieur, a juicy ham and cheese sandwich with Gruyere and a layer of béchamel sauce, fried together on sourdough bread. Lucky people who work downtown can grab this hearty meal daily. At least for the rest of us, we can keep our waistlines and cholesterol levels in check. 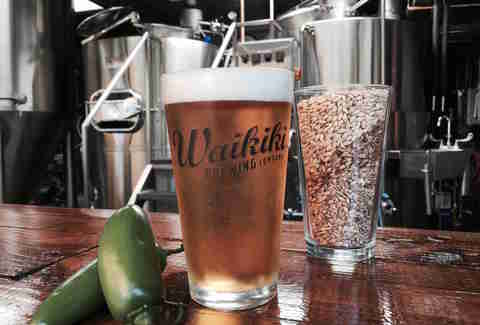 Waikiki Brewing Company (address and info) Waikiki It’s been a great few years for craft beer lovers in Oahu, and Waikiki Brewing Company marked the pinnacle of this beer-splosion when it opened this year. Taking over Cheeseburger Waikiki’s old banquet room, the brewery built an open-air establishment overlooking the busy, palm-tree lined Kalakaua Avenue. The current menu has nine local brews, ranging from blonde to pale ales, porters to brown ales. Adventurous tasters should try the Jalapeño Mouth amber ale, which (obviously) packs a spicy aftertaste. If you don’t want to commit to a full glass, get the sampler flight. Osoyami Bar & Grill (address and info) McCully/Moiliili Sliders, pub bites, a fully stocked bar... what more could you want? At this casual bar, everything is $9 or less, from fried Sriracha balls and kimchee fries, to chimichurri and cheesy, stuffed jalapeño burgers. Beer and cocktails aren't any different, so you can fill up without worrying about your bank account. Artizen by MW Restaurant (address and info) Downtown Tucked in the Hawaii State Art Museum at the edge of downtown Honolulu, MW Restaurant opened its newest eatery in December, but has already received plenty of praise for Artizen's casual, inexpensive, grab-and-go lunch options. The menu changes daily, but often includes bento, sandwiches, burgers, salads, and desserts. A mainstay is the mochi-crusted opah bento, served on a bed of somen noodles. 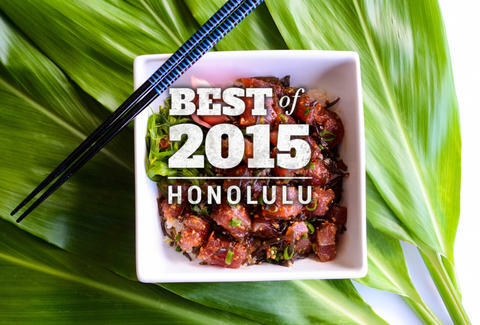 Sign up here for our daily Honolulu email and be the first to get all the food/drink/fun in town. Summer Nakaishi is a freelance writer for Thrillist and is terrible at keeping New Year’s resolutions -- mostly because she forgets to write them down.